Q1. How to use last command? Q2. How to customize output in case of non-local logins? Q3. How to make last read a different file? Q4. How to make last print complete date and time info? Q5. How to make last show only a specific number of lines? Q6. How to make last suppress hostname field in output? Q7. How to make last display info for a specific time period? Q8. How to make last display things like run level changes? If you are new to system administration, there'll be times when you'll have to monitor or access login related information. There are multiple tools that you'll likely use for this purpose, with one of them being last. In this tutorial, we will discuss the basic features of this utility using some easy to understand examples. Before we jump on to the explanation part, it's worth mentioning that all examples here have been tested on an Ubuntu 16.04LTS machine. last  searches  back through the /var/log/wtmp file (or the file desig? through the file; in the case of the SIGINT signal last will then  ter? Following are some Q&A-styled examples that should give you a better idea on how last works. Note: In the screenshot, we have intentionally blurred some parts containing IP addresses. Now, if you want, you can slightly customize this output by moving the IP address related column to extreme right. This can be done using the -a command line option. As already mentioned in the beginning of the tutorial, the last command reads the /var/log/wtmp file to prepare its output. However, if you want, you can make the tool read a completely different file. This you can do using the -f command line option. Of course, you'll have to pass the new file name (along with its path) as input to this option. If you want last to produce complete date and time information in output, use the -F command line option. If you want to customize the number of lines the last command shows in output, you can do that using the -n command line option. Of course, you'll have to pass a number to this option as input. So you can see the output only contains 3 lines. 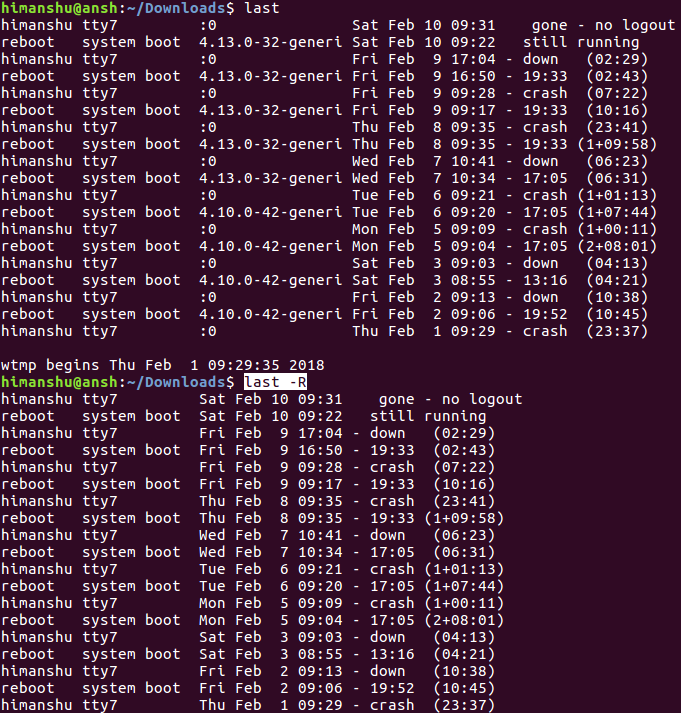 The third column in last's output is hostname information. However, for some reason, if you want the tool to suppress this information, use the -R command line option. 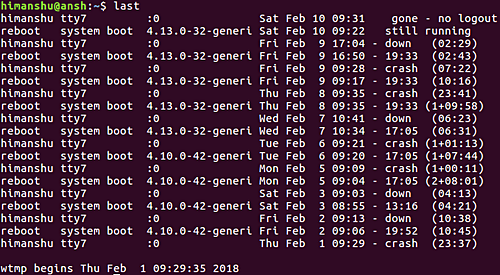 Suppose you want last to only display output based on time - say, only information from yesterday and today - then you ca use the -s and -t command line options. 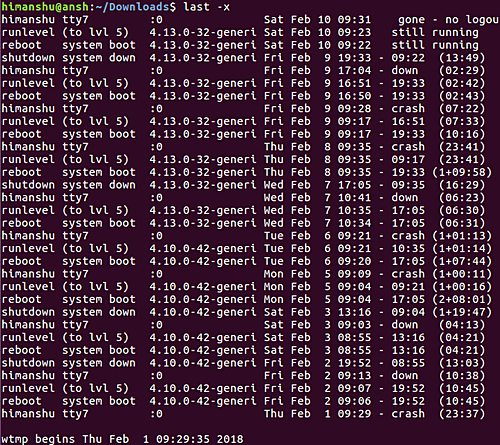 To display information like run level changes and system shut down entries, use the -x command line option. Agreed, last isn't one of those commands that you'll use daily, but there will likely be days where this tool would be of great help. We have covered several major options here in this tutorial - should be enough to get you started. For more info, head to the utility's man page. 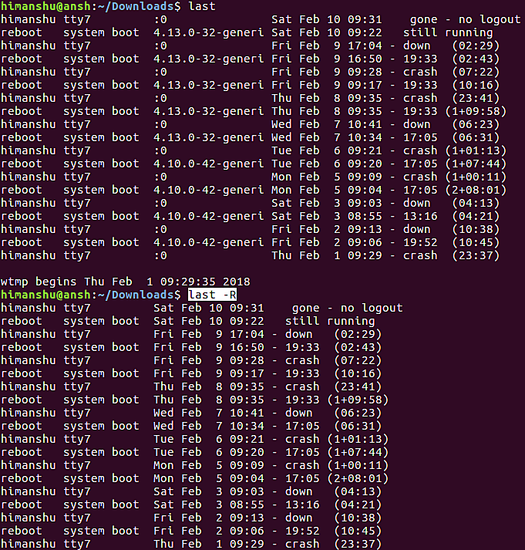 in my Centos7 machine but it shows me the error as Invalid arguments.